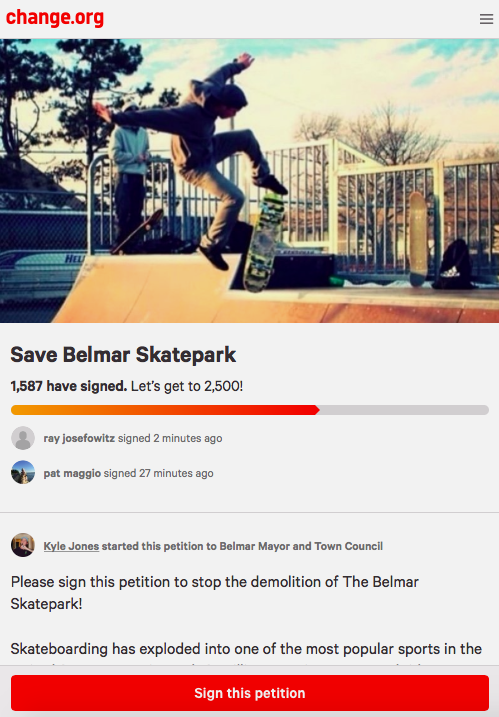 Common Sense For Belmar › Save The Skaters! This was written by admin. Posted on Thursday, April 11, 2019, at 5:38 am. Filed under Uncategorized. Bookmark the permalink. Follow comments here with the RSS feed. Post a comment or leave a trackback. I would prefer if they get the rest of the junk out of the “park” first. Great idea when the founders kids wanted it and they facilitated the building of it. Now, it is in disrepair and the founders have walked away. What’s the point of knocking it down? They probably need the space for…more parking! It’s a parking lot for drunkies. I go by the skate park almost every day and when the weather is nice there are many kids using it. Closing it down will force them to the street. It is getting them outside and off the electronics! They are safer in the park -keep it open!!! I was always against this because I knew the people behind it wouldn’t keep it up as they said they would (policing up is beneath people’s dignity). But over time, there have been some good things about it, such as it gets boys outdoors for a few hours. But also, young men use it. I wonder at a young man old enough to drive a vehicle still engaged in childish pursuits. So now, it’s about equal with me, knock it down or keep it up – no big deal either way. Half of them look like adults. Maybe it will force them to get a job. Silly me, they don’t have to work, Bernie and the socialistic views of the Dems. will take care of them. Public Safety is the primary responsibility of elected officials and above picture shows a skateboarder without a safety helmet. The skatepark is an attractive nuisance. I agree that the park should remain open as so many young people enjoy it. Exercise and fresh air are perfect together for young folks. But they need to follow the rules. Very few skateboarders wear helmets, especially the older ones, and many ride bikes up and down the slopes, which is prohibited. I saw a boy riding the skateboard with his back on the board, not standing upright. The rules are for their own protection. It would be terrible if a skateboarder got seriously injured because of not following the rules. A few years back an 18-year old from Middletown was paralyzed from the waist down. No helmet, no knee or arm protectors. Gotta keep something for people/ kids to do. Walsifer always hated that park- he was one of the only officers who would take our skateboards. Keep ripping everything down and soon you won’t know the difference between Belmar and Spring Lake. #11 – Sir/Madam, Part of life is the lumps and bumps we get along the way to our end. All the laws and ordinances in the world can’t stop the inevitable injuries that go with life. All that should be done is to take proper, reasonable precautions and let the chips fall where they may. It’s going to be that way no matter what anyway. The Kids Are Alright – Keep it going! Let the kids do what they want – helmets, no helmets…let them be kids…and let adults have fun blowing off steam for a bit too. Skateboarding injuries at parks like this are usually broken arms or ankles – not pretty but I’d call them “safe accidents” since they’re not head injuries. And it’s not a waste of taxpayer money to let the police patrol there – better than their summer job of D’Jais bouncer. When we were kids Playgrounds had paid Recreation Directors, period. Belmar Ordinance 2018-15 established a new Parks Commission on 11-20-18 … and any Skateboard Park matter is their purview … comments, concerns and suggestions should be directed to them. the current location is a hazardous waste site … across the street from Lake Como bars … not good. I would suggest moving it to a higher profile place … like Schroeder Park … the ‘Gateway to Belmar’.